The new Chromecast features an all new improved design and supports both 2.4 GHz and 5 GHz WiFi networks. You will find below the steps to Setup Google Chromecast on your iPhone and Android Phone. Chromecast has been completely redesigned and looks better in its new circular shape, compared to the previous version of Chromecast which looked like a thin rectangular stick. However, the most welcome change in Chromecast is its support for both 2.4 GHz and 5 GHz WiFi networks. This will be understood better by users of the first Generation of Chromecast who must have been frustrated by the annoying tendency of Chromecast to stop working as soon as the Smartphone switched to a 5 G network. Anyway, the second Generation of Chromecast supports 5 GHz WiFi and you won’t find it switching off or bothering you in any way, once it is properly set up on your iPhone or Android Phone. 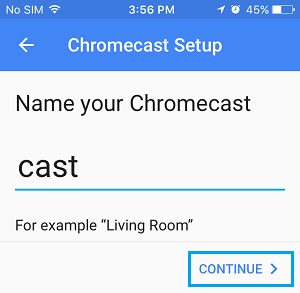 Setting up Google Chromecast on your iPhone or Android Phone is a pretty straight forward process. 4. Once the Google Home app has finished downloading, open the app and tap on Accept to agree to the terms and conditions of the Home app. 6. After tapping on Devices you may be asked to allow the Google Home app to see your device’s location. When asked tap on Allow. 7. 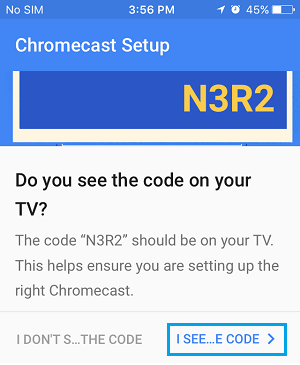 On the next screen, you will see your Chromecast, tap on the Set Up link to start setting up your Chromecast. Note: If you are unable to see Chromecast on this screen, make sure that Bluetooth option is turned on your phone. 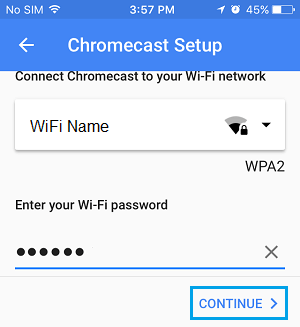 Also make sure that your phone is connected to Chromecast’s WiFi Hotspot. 11. On the next screen select your Country and tap on Continue. 12. On the next screen, you can change the name of your Chromecast (Any name that suits you) and tap on Continue. 13. 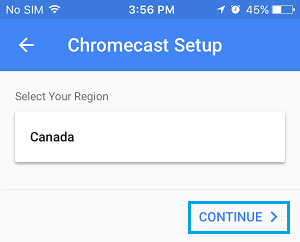 On the next screen you will be asked if you want to Send Chromecast Usage Data and Crash reports to Google and if you want to Enable Guest Mode. 14. On the next screen, select your WiFi Network, enter in your WiFi Network Password and tap on Continue. 15. 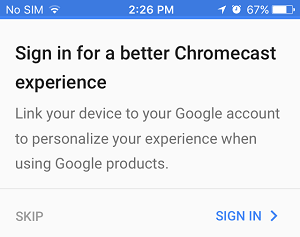 On the next screen, you can sign in to your Google Account to link Chromecast with your Google Account or you can skip this screen by tapping on Skip from the bottom left corner of your screen. 16. 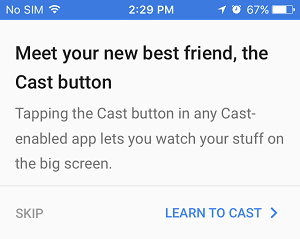 On the next screen, you can tap on Learn to Cast, in case you want to learn about how to cast videos or tap on Skip from the bottom left corner of your screen. 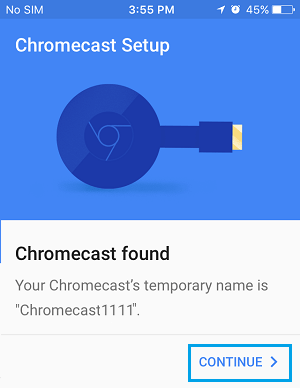 With these steps, you are now all setup to cast Videos and Movies onto the larger screen of your TV using Chromecast. 1. 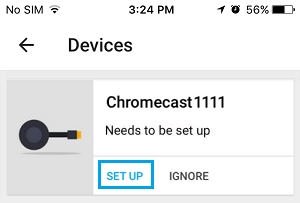 Tap on Settings > WiFi > Make sure that both your phone and Chromecast are connected to the same WiFi Network. 2. Tap on Settings > Bluetooth > Make sure that Bluetooth option is turned ON. 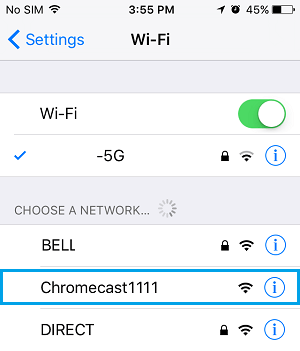 Once Bluetooth option is enabled on your Phone and you are connected to Chromecast’s WiFi Network, you should be able to setup Chromecast on your iPhone or Android Phone without any further problems.